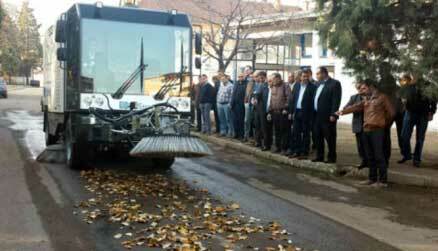 The Veles, Macedonia-based company "Brako" has started manufacturing trucks for vacuum street sweeping as a result of a joint partnership with Italy's "BioStrada" company. The mechanical street sweeper is an environmentally-friendly vehicle, entirely manufactured in Brako's plants. Macedonia (officially the Republic of Macedonia) is a country located in the central Balkan peninsula in Southeast Europe. It is one of the successor states of the former Yugoslavia, from which it declared independence in 1991. BioStrada and Brako's successful joint project is the first of its kind in Macedonia in which a local and foreign company are investing in a product intended to be exported and whose added value to a large extent belongs to Macedonia. "It is a technologically sophisticated product that includes many components that will be produced in Macedonia. I just found out that efforts are being made to enable Macedonian companies to manufacture components used for the vehicle that are now being imported. It is one of the Government's goals – Macedonian companies in cooperation with foreign companies to transfer a majority of the production here in Macedonia, new jobs to be created and more importantly knowledge from abroad to be used here in Macedonia," stated Deputy PM Vladimir Pesevski, speaking at the sweeper's unveiling press gathering. Brako has been focused on the production of this vehicle for years. Cooperation was established with "BioStrada" in 2011 to meet the needs of the Italian company. "After strengthening our experience in manufacturing composite parts," stated Koco Angjusev, chairman of the Brako Board of Directors, "we've made a step further to manufacture the first Macedonian sweeping vehicle. With this, Brako is opening a new chapter in its own production portfolio while introducing new perspectives for the competitiveness of Macedonia's production on foreign markets." 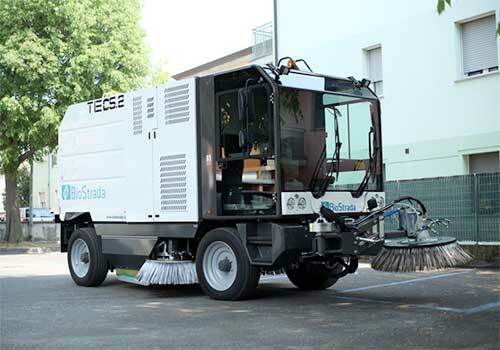 The first road sweepers will be exported on markets in Qatar and Italy. The vehicle has the capacity to sweep over 70,000 square meters per hour and offers advanced environmental performance. The machine uses a vacuum sweeping system to collect waste and dust, sending them to the central part of the machine. "BioStrada, during its 8-year existence, has succeeded in finding its place on the market for production of vacuum cleaning sweepers. It cooperates with countries in Western Europe, South America, Asia and Africa. We've already established cooperation with the US army. With an excellent development strategy we have made major steps in a short period of time. Today's launch of the joint partnership with 'Brako' for us is the opening of a new page that promises further achievements," said BioStrada's representative Alessandro Engioli. For more information, contact BioStrada through the company's web portal, located at http://biostrada.it/en/. © 2014 World Sweeper All rights reserved.